Dr. Goss is board certified in internal medicine, pediatrics, and adult pulmonary and critical care. 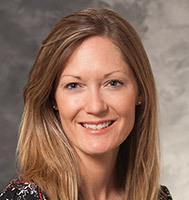 Her clinical interests include treatment of adolescents and adults with pulmonary hypertension, with an interest in transition of the adolescent patient to adult care clinics. Dr. Goss' research focus includes the long-term cardiopulmonary outcomes of prematurity, chronic lung disease caused by premature birth, and pediatric pulmonary hypertension.